Palki - Responsive Free Blogger Template here is another free blogspot blogger template by MS Design. Palki is a visual version of Naiyori Colored. If you running a blogspot blog and wanna make a simple professional blog, then Palki is perfect for you. 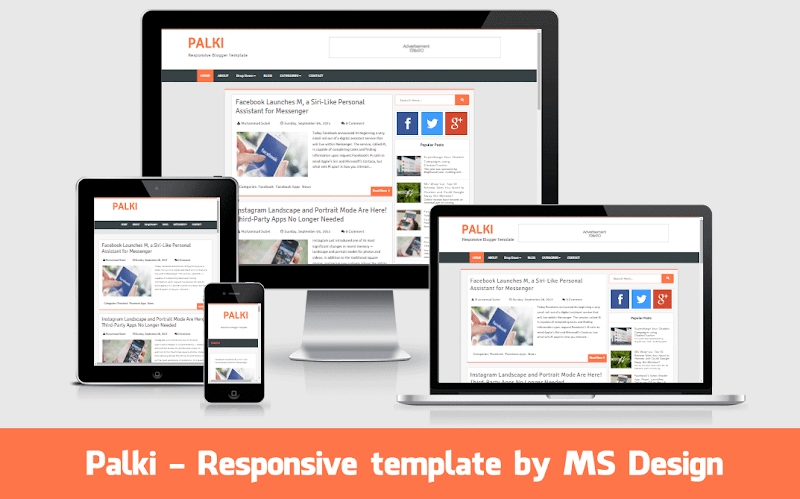 Palki is modern, clean and responsive blogger template for free. Although Palki is simple blogger template, but Awesome. This is fully SEO optimized blogger template up to 100%. In this template used Nicer Social icons Widget in sidebar. This a first full featured free blogger template by MS Design. Now see some awesome features of Palki. Palki is a fresh and clean blog style blogger template. Palki blogger themes is perfect for any kind of blog. Palki is a one of best template in all blogger themes. A fresh and clean design is important in every blog. Palki is a great and fresh designed free blogger themes 2015. If your looking for a awesome and simple blog style free blogspot templates then palki is only for you. Because it is awesome designed blogger template. In this template sidebar just used a awesome social media icons widget. Facebook social icons, Twitter social icon, Google plus social icon widget is used in this template with awesome hover effect. Palki blogger template is easy to customize. Dropdown layout and dropdown menu just easy and awesome to use. In this template main home page, below every posts used a beautiful readmore button. Blogspot readmore button can make every blog easy to navigate. Salam brother! i'm following you from a long time. You are good in your approch and looks more professional. I loved this theme. Thanks bro. Stay with us. you may find many tutorial in google about this topic. yeah! how may i help you? Sorry, You can remove footer credit only on pro version. আপনি কোন ডিভাইসটি ইউজ করেছেন? আপনার এই Template ইউস করে http://techseba24.blogspot.com/ এই সাইট টি তৈরি করেছি। কিন্তু Comment এবং Read More অপশন টি এর স্থানে অন্য ভাষার একটা লেখা আসছে। এখন কি ভাবে এইতা সমাধান করতে পারি...? No supports included in free version. hello....... cant find the social icons, any help? Hey, Can u help me to show full thumbnail images in homepage? Like shoutmeloud?? ?